Your big toe is the hardest-working toe. Every time your foot pushes off the ground, this toe supports most of your body’s weight. Because the big toe is so critical to movement, any problem with it can make walking or even standing painful. A bunion (excess or misaligned bone in the joint) is one of the most common big-toe problems. In addition to causing pain, a bunion changes the shape of your foot, making it harder to find shoes that fit. But you don’t have to hobble for the rest of your life. Bunions can be treated. With Dr. Henry’s help, your feet can feel and look better. 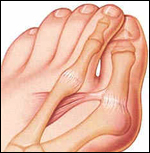 Although they may develop on the fifth (little) toe, bunions usually occur at the base of the big toe. 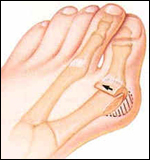 Bunions are often caused by incorrect foot mechanics. The foot may flatten too much, forcing the toe joint to move beyond normal range. In some cases, joint damage caused by arthritis or an injury produces a bunion. And some people are simply born with extra bone near a toe joint. If you’re at risk for developing a bunion, wearing high-heeled or poorly fitting shoes make the problem worse. Positional bunions arise from the growth of new bone. Structural bunions result when the joint at the base of the toe shifts position. Many bunions are a combination of both types. A bunion is a bony bump, usually near the joint at the base of the big toe. As new bone grows, the joint enlarges. This stretches the joint’s outer coverings. Force created by the stretching pushes the big toe toward the smaller ones. Eventually, the inside tendons tighten, pulling the big toe farther out of alignment. To determine the best treatment for your problem, your doctor may ask if and when your bunion causes pain. Your doctor may also test how far and how smoothly the affected joint moves. To see if incorrect foot mechanics is causing your problem, Dr. Henry may watch how your feet rotate and flatten as you walk. To see how well a joint works and to learn if movement causes pain, Dr. Henry may move the joint back and forth. X-rays may be taken of your foot to show the position of the big-toe joint. Dr. Henry may also want to see whether the bunion is affecting other bones in your foot. If a bunion is not severe, Dr. Henry may recommend that you wear a different style of shoes. Or you may be prescribed custom-made shoe inserts (orthoses) to control incorrect foot mechanics. For severe bunions, outpatient surgery may be recommended. Within hours after surgery, you’ll be on your way home and ready for recovery. To realign the affected joint, any tight tendons on the inside of the toe are released. New bone that makes up the bunion is shaved away. 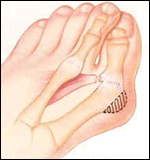 The most common bunion surgery reduces the angle between the first and second toes. Bones in the big toe are realigned and the bunion is shaved away. Ligaments and tendons on the outside of the toe may be tightened to hold the joint properly. If structural bunion is severe, a piece of bone is removed from the first metatarsal (the long bone behind your big-toe joint). Once repositioned, this bone may be held in place with a pin or a screw. Any new bone that makes up a bunion is shaved away. Bunion surgery can both reduce pain and improve the appearance of your feet. For best results, see Dr. Henry as scheduled and follow all recovery instructions. Your foot will be bandaged after surgery. If soft tissues were shifted, you may be given a splint to limit foot movement for a while. In such cases, the majority of healing should occur within a few weeks. If bone was cut, you may need to wear a surgical shoe or your foot may be placed in a cast. Depending on the extent of the repair, healing may take several weeks.